Our beautiful aluminum candles from Will & Baumer® create the warm ambiance of elegant candelight without the wax mess. Each polished aluminum candle comes with an inner spring ensuring a dripless elegant candlelight presentation. A perfect gift for weddings, anniversaries, holidays or religious ceremonies. Consists of three parts; Outer Shell, Inner Spring Unit and a rubber adapter. 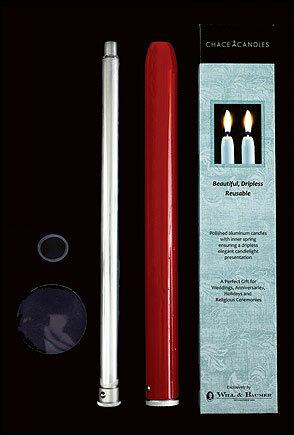 1 pair of aluminum candles per box - wax candle inserts sold separately (Item 87007P).